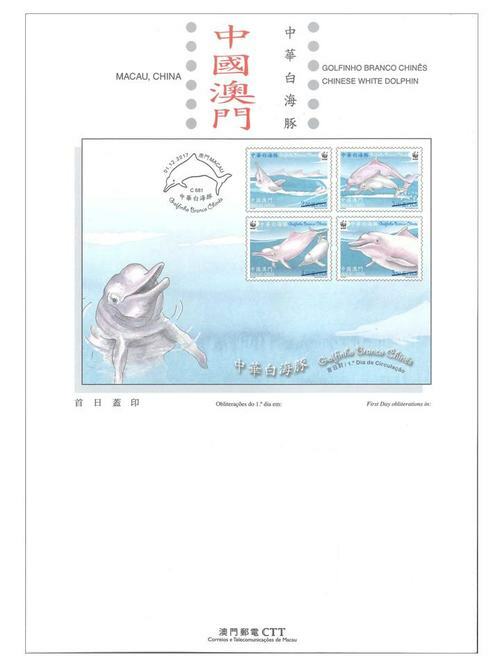 Stamp Issue "Chinese White Dolphin"
Macao Post and Telecommunications Bureau will issue the stamp theme “Chinese White Dolphin” on 1st December, 2017. 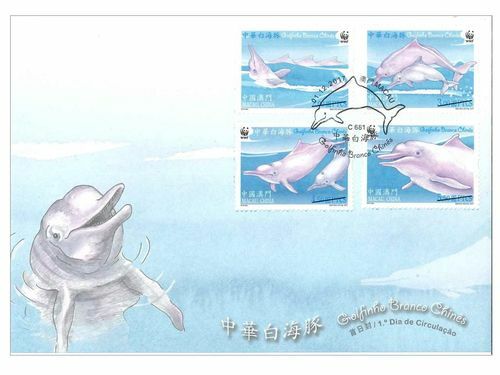 The Chinese white dolphin (Sousa chinensis), also known as Indo-Pacific humpback dolphin, is the marine mammal of the Delphinidae family. 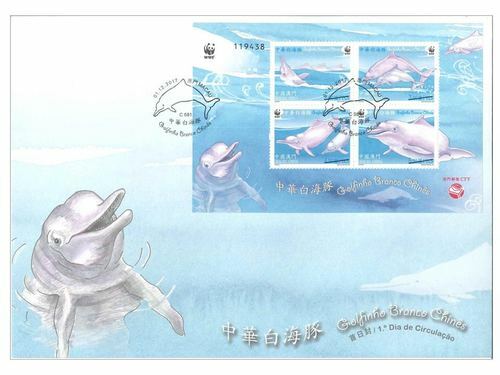 Macao situated in the west coast of Pearl River Estuary; is an important distribution area of Chinese white dolphin in Pearl River Estuary. This is largely related to the fact that sea water and fresh water merge together in the waters of Macao with appropriate temperature, salinity and depth, gathering a massive amount of fish. 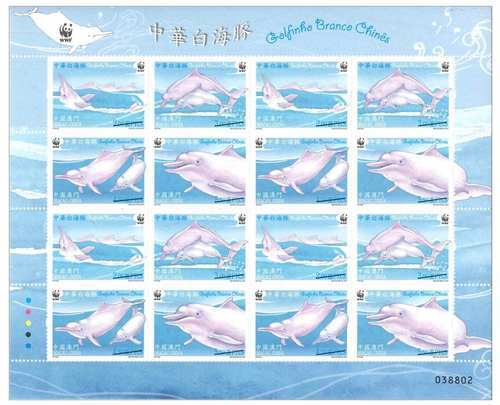 According to the “International Union for Conservation of Nature (IUCN) Red List 2010”, the Chinese white dolphin is listed as “Near Threatened”. Meanwhile, it is also listed as “Grade 1 National Key Protected Species” in China and included in the Convention on International Trade in Endangered Species of Wild Fauna and Flora (CITES) Appendix I, which means that the concerned international trade is completely prohibited. 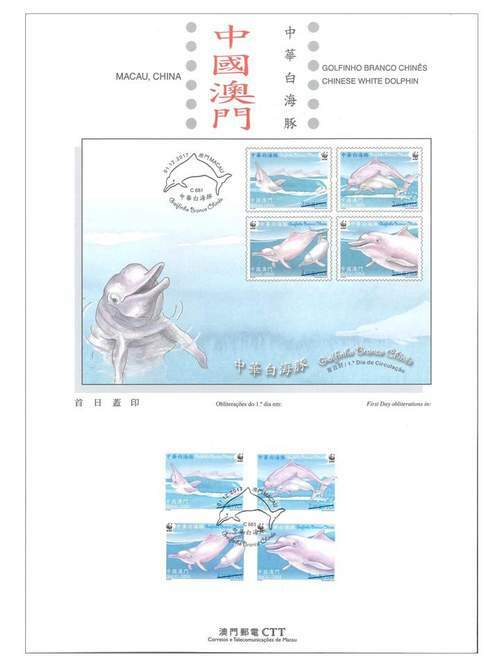 This issue includes a set of four stamps and one souvenir sheet, the images demonstrating the beautiful posture of the Chinese white dolphin; and the souvenir sheet contains the full set of stamps. 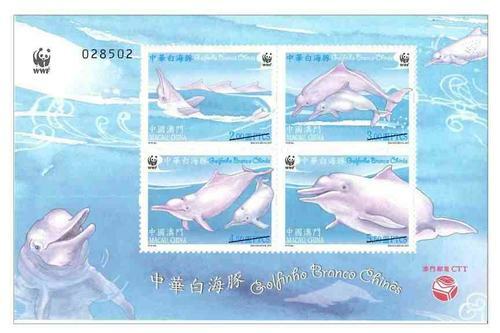 The stamps and souvenir sheet are bearing the World Wide Fund For Nature (WWF) Panda logo, this is the second issue launched in collaboration with the WWF after the “50th Anniversary of WWF” issued in 2011. This is the last of the twelve themes in 2017. 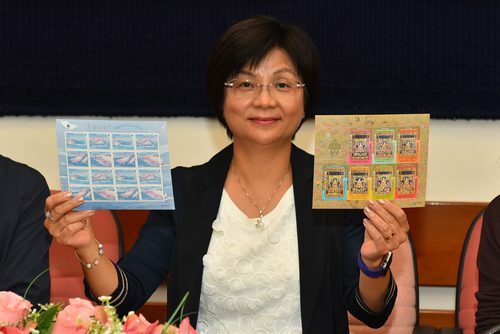 The previous issued stamps are “Lunar Year of the Rooster” on 05/01/2017, “Macao: Back to Common Roots” on 10/02/2017, “Traditional Chinese Culture” on 01/03/2017, the label stamp “Lunar Year of the Rooster” on 17/05/2017, “Chinese Opera – Farewell My Concubine” on 08/06/2017, “Social Welfare Services of Macao” on 03/07/2017, “90th Anniversary of the Founding of the Chinese People’s Liberation Army” on 01/08/2017, “Tung Sin Tong – 125 Years of Society Solidarity” on 08/08/2017, “150th Anniversary of the Birth of Camilo Pessanha” on 07/09/2017, “Lotus Flower” on 09/10/2017, “Chinese Furniture” on 10/11/2017, and “Thangka – Seven Buddhas of the Past” to be issued on 21/11/2017. 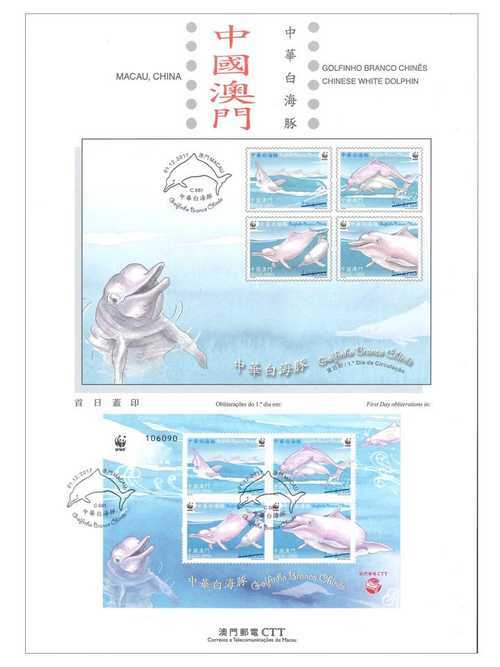 Technical Data of Stamp "CHINESE WHITE DOLPHIN"